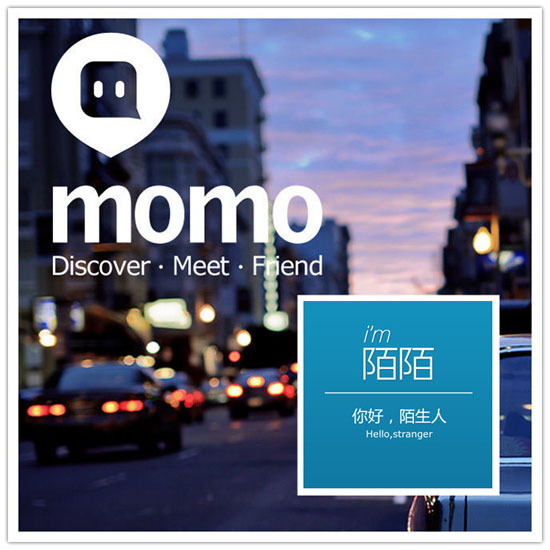 Momo: China’s Next Social Conglomerate? It is rumored that Momo, the Chinese mobile social service, will file for IPO in the U.S. next month (Update: It files with the SEC on November 8). Generally referred to as a location-based social networking app for strangers, Momo however has been building features or services to help users get acquainted, aiming to become an interest-based mobile social network. 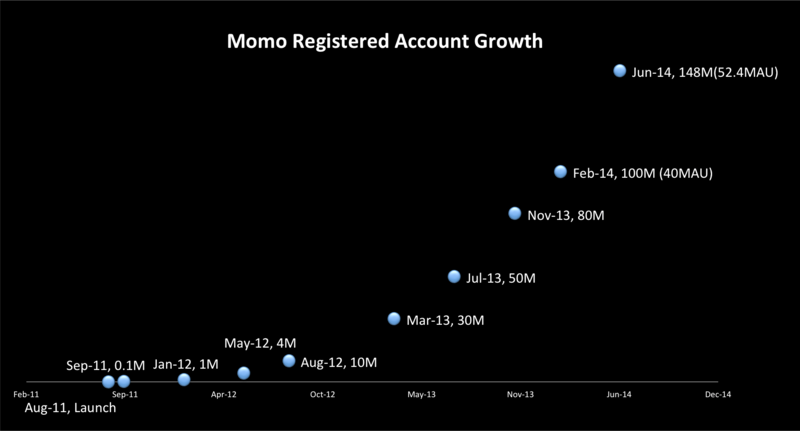 It took Momo less than three years to register 150 million accounts. Though that’s still not as fast as WeChat, which launched several months earlier the same year, Momo has been a phenomenon in mobile social networking in China. After joining the company, Wang Li, now operation chief, was told by Momo CEO that what they were working on was a QQ for Mobile, said Wang in an interview with Huxiu, a local online news & blogs platform (source in Chinese). So, to many in China’s tech industry, the Momo story so far isn’t much of a surprise. What’s more surprising must be that Momo has managed to grab a share in China’s instant messaging market in a relatively short period of time from Tencent, who has been considered unbeatable in the market. Momo began monetizing its user base in mid-2013. So far revenue sources include mobile gaming, premium subscriptions, paid items, and advertising — most are similar to QQ’s. Since launching their first mobile game in November 2013, Momo has introduced four games developed by third-party developers and customized for Momo users, sharing in-app purchase revenues with developers. Momo Craft, a strategy game, had gained one million active users and generated RMB12 million (just short of US$2M) in sales in the first month since its launch, disclosed Mr. Tang in February this year. Momo has been adding location-based services such as events nearby. The company thus is able to take commissions from businesses. In July this year a location-based advertising system for businesses was unveiled. Businesses would be able to buy ad space based on locations and how large an area they’d like to cover, or interact with customers without leaving the app. Users could put through calls with a click on the telephone number shown on the page of a store. The location-based offerings for both users and businesses were not possible with QQ IM in the “PC era”. The iOS app was launched in August 2011, the Android version in December that year, and the app for Windows Phone in September 2013. Momo 1.0 (August 2011). Users could see users nearby and interact with them with text or voice messages, or photos. It was one of the first location-based mobile social services in China. Momo 2.0 (October 2012). “Group” feature was added where users could create groups and other users could join a group chat. Momo 3.0 (January 2013). Users could import existing contacts from Weibo and their mobile phone address book. Momo was no longer a service for strangers only. Momo 4.0 (June 2013). Through “Activities Nearby” users can check concerts, sports, performing arts and the like near them; “Momo Bar” enables users with similar interests to create themed forums; “Wandering” allows for checking out users in certain places. All of those features were ways to have users stay on Momo for longer. Paid emoticons and premium membership available with this version marked the beginning of monetization. This version also introduced a Snapchat-like photo feature. Momo 5.0 (August 2014). A user rating system was introduced that users would be, based on user profiles and performance, graded into six tiers, from untrustworthy to five star; higher ranked users can enjoy more premium services. This encourages users to behave well, and to be more active. A location-based advertising system was launched on this version. Momo has raised three rounds of funding. Alibaba Capital Partners, DST and Matrix Partners China participated in the US$40 million Series B round in October 2012. Bottonwood Capital is its angel investor. The company launched an English version in October 2012 but announced it would shut it down in July this year. Founded by six co-founders in March 2011, Momo now has more than 400 employees. The leading co-founder Mr. Tang Yan worked at Netease’s online news service as editor-in-chief before Momo.